The calendar says Spring even though the wind and temperatures still say Winter. If you haven’t already started your Spring garden, it’s time! If you’re new to vegetable gardening, you’ll want to pick a spot with at least 8 hours of daily sunlight that drains well, and you’ll want easy access to water. If you’re planting in the ground, you should send off a soil sample (boxes and forms available at local extension offices) that will help you make decisions about your soil. If you’re planting in raised beds or containers, you can buy ready mixed garden soil or mix your own. The Gardener's Supply Advice website has great on line tools for calculating soil volumes, themed garden ideas, and much more. If you’re planting anything that vines or gets very tall, installing support systems early works best. In this part of Virginia, we have a long growing season that allows us to grow a huge variety of crops. 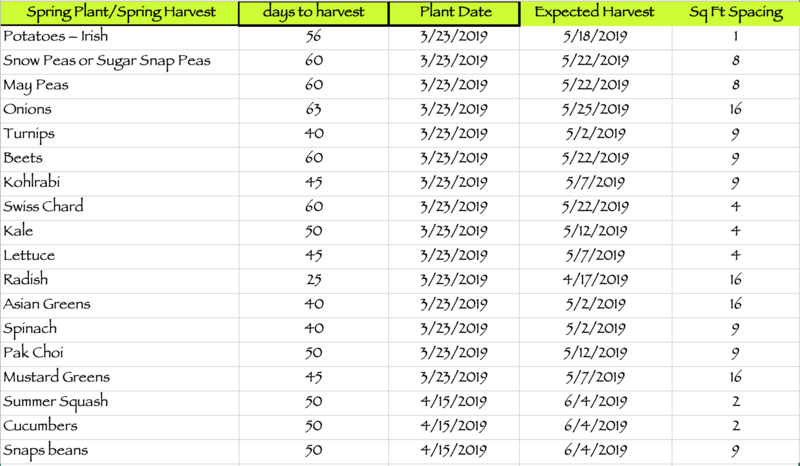 Below is a chart with some ideas for early and mid Spring planting, but there are plenty of other crops we can plant now or in April. Just don’t get ahead of the season and plant warm weather plants like tomatoes this early. Planting well after the last frost is best for tomatoes, most melons, peppers, eggplant, okra, butterbeans and more. It will be worth the wait! Another important part of vegetable and fruit gardening is welcoming “good bugs” to your garden. These include pollinators such as bees and butterflies as well as insect predators such as spiders and praying mantis. You can attract pollinators by including flower plantings in with your vegetable and fruit crops. Marigolds, Zinnias and Sunflowers are just a few easy annuals to consider. The predators will come – you just need to resist the urge to kill them! Please join Healthy Suffolk Digs on Facebook to get regular updates and information on upcoming garden events. And please share photos from your garden! We’d love to see some veggie selfies!